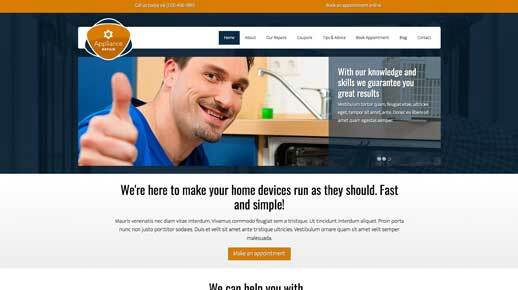 Designed specifically for appliance shops, the Appliance Repair WordPress Theme is just right for you. 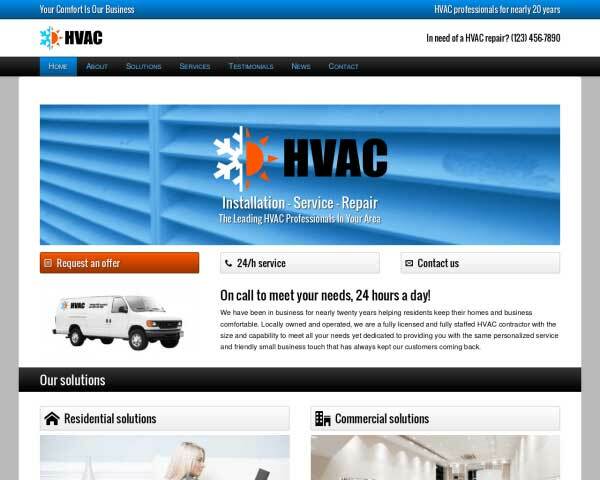 The visually appealing theme makes it drop-dead easy to promote your appliance business. Simply replace the placeholder content with your text and images and you're ready to rev up the rankings! 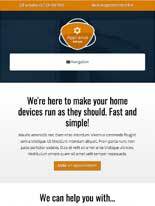 Building a responsive appliance website with the Appliance Repair WordPress Theme is quick and easy, even if you've never built a website before. 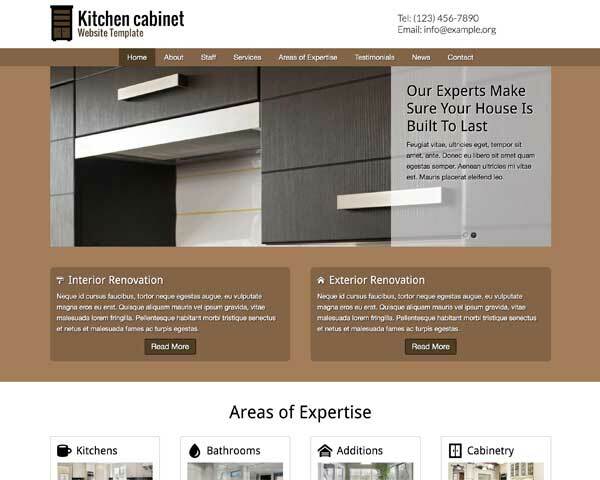 Its elegant design and clean layout provide a solid framework for your personal style. It's all set up and waiting for your photos and text. No coding skills are required to customize the color scheme and style your content thanks to our unique front-end editing tool. 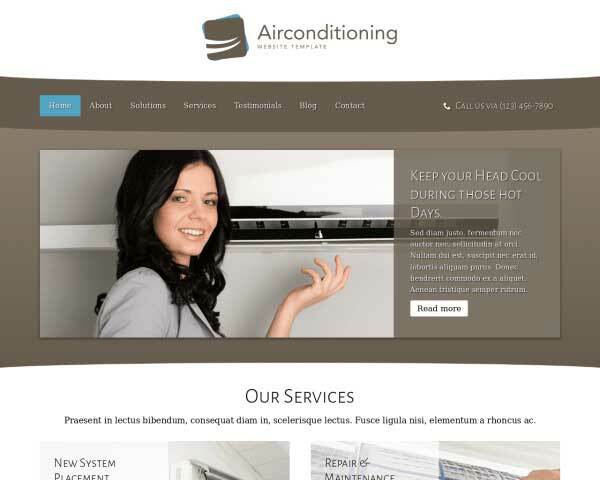 A great-looking, professional website for your appliance business is within your reach when you start with the Appliance Repair WordPress Theme. Share news and articles on the Appliance Repair WordPress Theme's built-in blog. Regularly updating your your website with relevant content can help boost search rankings. 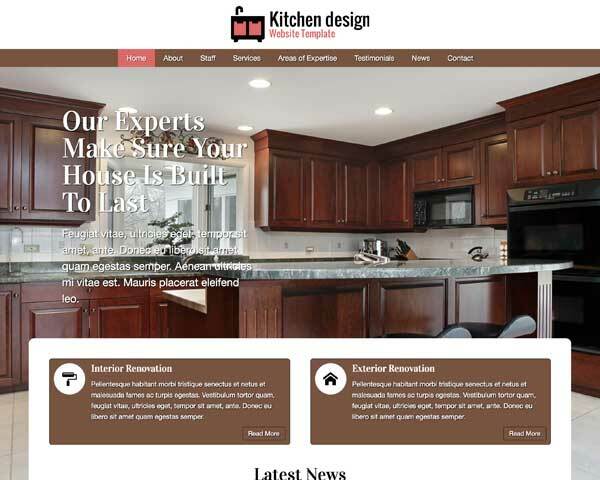 Opposed to the average WordPress theme you can find on the internet, this Appliance Repair WordPress Theme was designed specifically to create a professional online presence for appliance store owners. 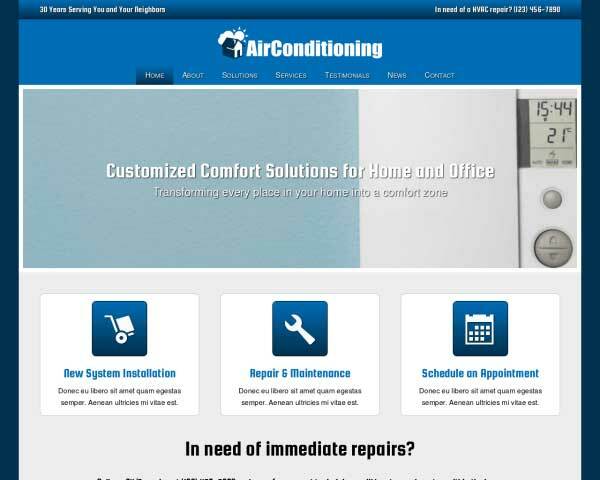 Visitors won't have to search for a way to get in touch thanks to calls to action prominently displayed on every page of the Appliance Repair WordPress Theme. The contact page on the Appliance Repair WordPress Theme is set up with space for your contact details, an integrated Google map and a route planner. 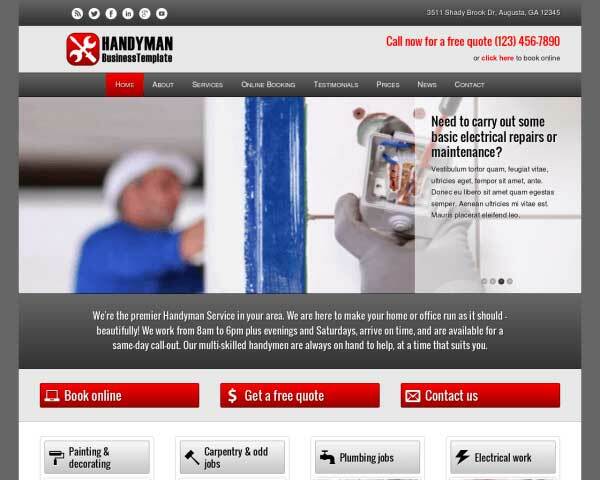 The Appliance Repair WordPress Theme comes with a page for coupons and promotions. Images and buttons can be linked to a PDF file that customers can download or print. The layout of the Appliance Repair WordPress Theme steers visitors to the most important parts of your website with a clear design. 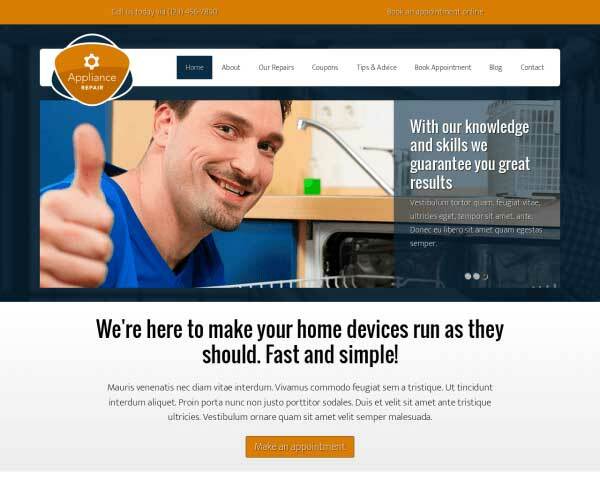 The clean layout of the Appliance Repair WordPress Theme let's your website's visitor know instantly what solution you can offer for their respective problems. 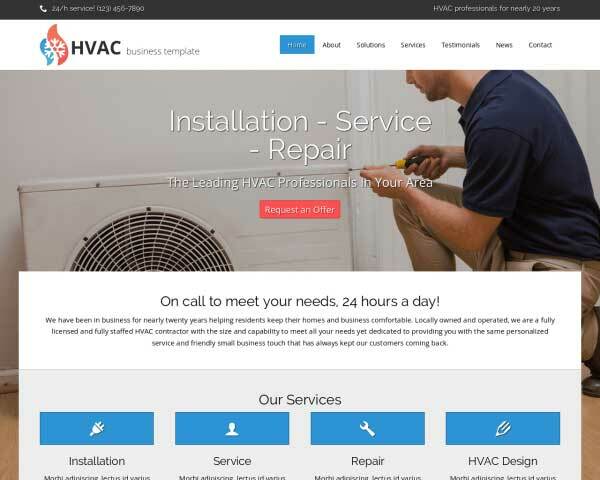 The best way to promote your services with the Appliance Repair WordPress Theme is to do let others do the talking for you. We've included a stylish testimonials page for you to fill with your own quotes. 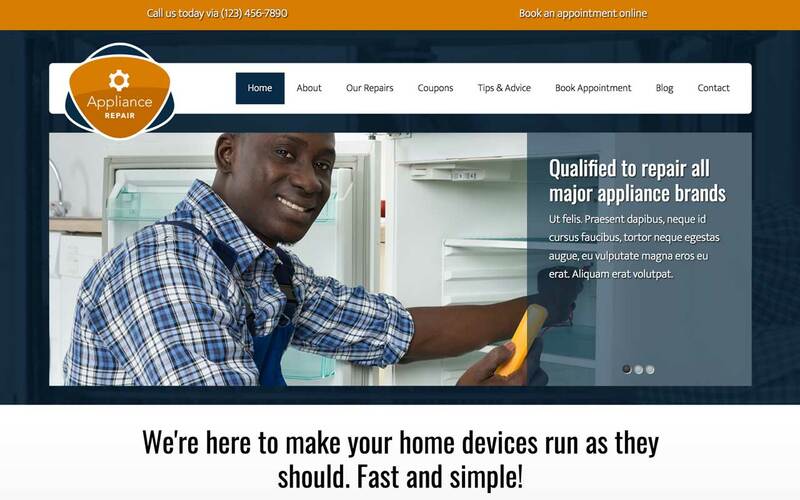 If you want a sleek mobile version of your new website, you'll be glad to know that our responsive Appliance Repair WordPress Theme is mobile-optimized right out of the box. Without any additional coding or plugins required, this website template will automatically adjust the layout of your text and photos to display neatly on any screen size. Mobile visitors will enjoy the the same professional design and user-friendly navigation of the desktop version, plus the ability to simply tap on your phone number to dial.